The Legend of Zelda: Twilight Princess HD Launches with a Wolf Link amiibo. The Nintendo games launching in the first part of the year are going to include some fun amiibo functionality. Games like The Legend of Zelda: Twilight Princess HD for the Wii U console and Mario & Sonic at the Rio 2016 Olympic Games™ for the Nintendo 3DS family of systems, both launching in March, use a wide variety of different compatible amiibo figures. Some new amiibo figures will also launch in March, including the legendary Wolf Link amiibo that is included in every physical version of The Legend of Zelda: Twilight Princess HD, as well as three new figures in the Animal Crossing amiibo series, featuring fan-favorite characters like Timmy & Tommy, Kapp’n and Rover. The previously announced Ryu, Roy and R.O.B. (Famicom Colors) amiibo figures will also launch in March. 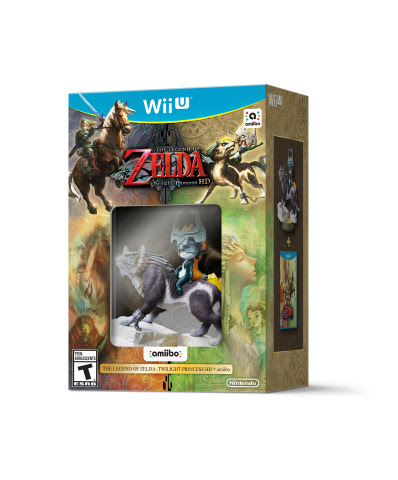 In addition to the Wolf Link amiibo, other amiibo figures in the Super Smash Bros.series like Link, Toon Link, Zelda, Sheik and Ganondorf will work with The Legend of Zelda: Twilight Princess HD. By tapping the Link or Toon Link amiibo, players can replenish their arrows. Tapping Zelda or Sheik will refill the player’s hearts, while, in a devious twist, tapping the Ganondorf figure will actually make Link take double the damage!